The Marantz PMD620 has begun shipping, and the reviews are starting to roll in. As more people write up their thoughts, I’ll update this post. Oryoki at the Yahoo! Nature Recordists group has written up a detailed review of the PMD620. In a nutshell, the recorder is tiny, almost the size of an iPod Classic and fitting easily into your pocket. It weighs just six ounces. 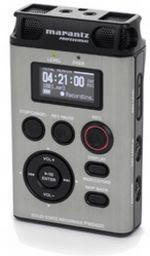 The unit takes just about 3 seconds to start up, has an easy to read LED screen, gets about 4.5 hours of battery life, and can record files over 2GB in size (a limitation many earlier recorders struggled with). Oryoki reports that the built-in mics are decent if properly directed, but that you’ll get some handling noise unless you use an external mic with the 1/8th inch mic input. You’ll probably want that external mic anyway, because you’ll get less hiss (depending on the mic, I would assume) than if you use the internal mics. If you’re interested in more details, I would highly recommend checking out Oryoki’s complete writeup, and make sure to check out the comments. The folks at Wingfield Audio have posted a review as well. They say the PMD620 is about the same size as an Edirol R-09 recorder. It may have a small display, but the fonts are crips and easy to read. The buttons are big and responsive. As expected, the built in speaker doesn’t sound very good. But if you want to have a chance to double check your recording without using headphones, it’s a nice option to have. Tracks can be split on the fly while you’re recording by pressing the record button again. I prefer devices that have a separate “track mark” or “divide” button, but this is better than nothing. One thing I learned from this review is that you need to be in record/pause mode to set your record volume. I’ve gotten so used to the hardware volume knob on my PCM-D50 that I’d kind of forgotten that many low end recorders are stuck with this limitation. Jeff Towne over at Transom is in the process of testing a PMD620. A complete review should be coming soon, but in the meantime, he’s posted a few thoughts in the comments of his Zoom H2 post. In a nutshell, Towne agrees that the PMD620 has great preamps. In fact, he says it sounds better with an external mic than any other low-cost recorder he’s tried (meaning the Zoom H2, Edirol R-09, M-Audio MicroTrack, Zoom H-4, and possibly the Marantz PMD660). Bu there are some problems, not the least of which is a latency issue with the headphones. In other words, you’ll hear what you’re recording slightly after it’s recorded. I’ve experienced a similar issue with the Samson C01U USB microphone, or when using the Ardour digital audio workstation to record audio on a PC running Linux. And let me just say, it can be annoying as all get out. Stay tuned for Towne’s complete review, which will almost certainly feature sample audio recordings. Update: Transom has published a thorough review of the Marantz PMD620. Here are the highlights, but you should definitely check out the original review for audio samples. Small, easy to use device with big buttons and an easy to read display. Recordings sound good with external dynamic mics or condensers with batteries (there is no phantom power available. Even though the PMD620 has a 1/8th inch microphone jack, it sounds better with external mics (meaning there’s a lower noise floor/hiss level) than many other low cost recorders with 1/8th inch, 1/4th inch, or even XLR inputs, including the Marantz PMD660. You can make track marks automatically at regular intervals or by pushing the record button to start a new file. You can save 3 presets, so if you like to have separate profiles for stereo, mono, and MP3 recordings, you can save those attributes. The headphone jack is placed inconveniently between the two internal mics, so you can get a lot of noise if you’re monitoring your recording with those mics. You can hear yourself pressing buttons if you’re using the internal mics, particularly because the volume control is a rocker switch instead of a dial. That latency problem is probably the biggest drawback. (audio link). Revie Jeff Towne concludes that Marantz just doesn’t figure people will be using headphones to monitor their recordings, which seems a bit silly. You can’t see both the record time remaining and the level meters on the display at the same time. While the PMD620 does indeed producer cleaner sound with an external mic than the Zoom H2 or other low cost recorders, I would recommend checking out my Sony PCM-D50 review and comparing the noise floor on my samples with Towne’s PMD620 recordings. Although we recorded our sample audio in two very different environments, it sounds to me like the PCM-D50 is much, much cleaner. And it only costs about $100 more than the Marantz recorder. about the size of a pack of king sized cigarettes, all I expected from Marantz with a couple of drawbacks. The biggest being the really bad internal speaker quality and volume, should be described as an earphone and not a speaker, doesn’t even come close to being able to hear anything legible from it at all. The main screen display could scroll the file name, the options screen does it but not the listening screen. Overall frequencey response falls a little short of expectations with the bass being boomy from the internal mics, with or without low cut enabled and the mids highs are a little flat. Definateley not designed for music recording from the internal mics. Otherwise a fine recorder in a micro package. Not for you mp3 player types though. Fix the speaker and I’ll give it a 9 of 10, right now its a 7 of 10, sorry Marantz, you needed to get input from users before you build em. Makes a good backup for my pmd420’s. I've read that Marantz has fixed the latency problem, through a firmware update. As for the pathetic sounding speaker, it's there to tell you IF you got the take, not to do critical listening ( you ever heard of Shure in-ear headphones? ). Criticizing it for poor reference monitoring / loudness is like criticizing a Cooper Mini for not being able to haul 53ft containers the way tractor trucks can: it's there for a distinct & different purpose. For me, it seems a trade off between the shirt-pocket weight of the Marantz, vs the *potentially* cleaner sound of the Sony. I'm after it for on-talent sound, in video recording ( mix it in, in post ), as there's zero likelyhood of the mic being aimed at the wrong part of the room, being too far away, or being overwhelmed by bad room acoustics, if it's on the person. I only wish SOMEONE would explicitly state ( is this secret information? ) if the mic-in on both Marantz and Sony portables had plug-in power, at what voltage, and does the mic-in happen to be stereo, so as to know if an external pre-amp was required for ideal quality, and which mic(s) to get ( lavs ) to go with it. Thanks much for the useful & informative page, & blessings! I had problems with an undocumented function which will not allow a recorded .wav file to be played from my PC. It seems that when you update to the latest firmware, now .wav files have to be played from within the recorder first. When you do this, the recorder will flash a message that says “Restore”. Now you can export the file from SD card to your PC where it will play. I called Tech support and they only told me that they have not heard of this issue but that I must have bought inexpensive memory and it is not stable enough to record with their player. I am using Transcend memory, not exactly a low end manufacturer… Wouldn’t you agree? I have seen that the problem exists with some Kingston Memory. I found it disconcerting that the tech support says that they have not heard of this, but somehow their player is obviously programmed to make some sort of change to the .wav file to get it to play. The fact that the restore is happening means that the flashware is doing something it has been programmed to do. The latest firmware (as of Dec 2008) is v2.27 which I received from Marantz with a short update guide. There is no latency, the auto level control (ALC) works great, the data formats are all correct (as far as I can tell from use in Adobe Audition, Windows media player, Winamp, and various other wav, mp3 players and editing programs. The noise floor on this unit is very very good and the recording quality is pristine. I have made several recordings of just me and my Taylor guitar. The recordings were so convincing that my wife thought I was playing when I was I was simply playing back the music on my home system. The battery life claims of 4 hours are grossly conservative. I use 2200mAhr NiMH rechargeables (that are a year old btw). I get 6 hours from these batteries. I have 2600mAhr AA’s on route. I suspect that one could get as much as 7 hours of recording on a good set of NiMH rechargeables …. that should put a smile on your face. I have recorded using both the external mic and my PA system line out with everything from the previously mentioned acoustic setting, to my entire band blaring at club levels. Everything came out sounding fantastic. The ability to mount the unit on a tripod (my camera tripod) is perfect. Other recorders require an additional purchase for this. I researched alot before making this purchase. I compared the Marantz to the Edriol 09HR, The M-Audio Microtrack II, and the Sony PCM-D50. The Edriol had lower audio quality to my ears, and persistant quality issues with the phone jack breaking. The M-Audio’s use of a proprietary battery that must be sent back to the manufacturer to be replaced (think iPod esque) removed it from the running despite its good recording quality. The Sony simply got disqualified because of price. If money were not of any concern, it would have won. I paid ~$320 USD for the Marantz. In this price category, it is the best unit presently being made. I just ordered a PMD620 after researching it intensively for about a week now. The thing that swayed my decision towards it is the quality of PMD620 sound samples available on the web. To my ears it has a fuller, richer sound than its main competitor, the Edirol R09HR. I’ve also seen reports indicating that its external mic preamps are quieter than the Edirol’s. It seems to offer the best bang for the buck in its class. Mind you, it would have been nice to see a slightly larger form factor, a bigger display and the ability to adjust recording levels on the fly.